So after seven episodes, the identity of the mole is revealed. It’s interesting that they didn’t pad it out for longer, instead the reveal happens at the ten minute mark. Peter Guillam displays understandable anger at the lives lost. “You butchered my agents… How many since? How many? Two hundred?… Three?… FOUR?” Smiley remains calm, although in his own undemonstrative way he does display the odd spasm of anger later on. So Gerald the mole was Bill Haydon. Smiley contacts Lacon, Alleline, Bland and Esterhase and plays them the incriminating recording which proves Haydon’s guilt. Esterhase: Well, that’s that. Congratulations, George. Smiley: Would you agree with me, Percy, that our best course of action is to make some positive use of Bill Haydon? We need to salvage what’s left of the networks he’s betrayed. Smiley: We sell Haydon to Moscow Centre for as many of our men in the field as can be saved – for humanitarian reasons. Professionally, of course, they’re finished. Smiley: Then the sooner you open negotiations with Karla, the better. Well, you’re much better placed to talk terms than I am. Polyakov remains your direct link with Karla. Lacon: The only difference is, this time you know it! It’s definitely your job, Percy. You’re still Chief, officially… for the moment. Percy Alleline: Very well, George. It’s a moment of triumph for Smiley, but there’s no overt display of emotion or triumphalism. Indeed, as we’ll see, it’ll turn out to be something of a pyrrhic victory. Although as the above dialogue extract indicates, he must have displayed some pleasure in Alleline’s discomfiture, who is clearly on borrowed time as Chief. Before Haydon is sent back to Moscow, the interrogators are keen to extract every piece of information they can. The next time we see him, his face is covered in bruises, there’s blood on his shirt and he’s walking unsteadily – a clear sign of how he’s been “encouraged”. It’s felt that he may open up more to Smiley, and in a way he does. This enables Guinness to take up his usual role as the largely unspeaking observer – but it’s nevertheless quite easy to understand exactly what he thinks and feels just by the expressions on his face. 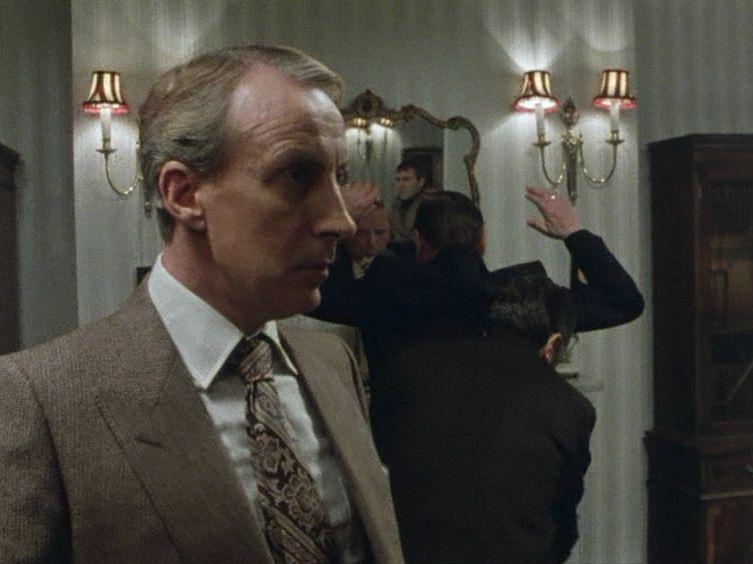 Ian Richardson takes centre-stage in these scenes as he explains why he became a Russian agent. Haydon: What do you want to know? Smiley: Oh… why? How? When? Smiley learns that when Haydon had the affair with Ann, it was on Karla’s orders. He also keen to know about whether Haydon expected Jim Prideaux to be sent on the abortive Czechoslovakia operation. As the friendship between Haydon and Prideaux has been stressed several times, there’s an undeniable sense of emotion as he replies to Smiley’s questioning. Smiley: Did you expect Control to send Jim Prideaux? Haydon: Well… obviously we needed to be certain Control would rise to the bait. We had to send in a big gun to make the story stick, and we knew he’d only settle for someone outside London Station, someone he trusted. Smiley: And someone who spoke Czech, of course. Haydon: Naturally. It had to be a man who was old Circus, to bring the temple down a bit. Smiley: Yes, I see the logic of it. It was, perhaps, the most famous partnership the Circus ever had: you and him, back in the old days. The iron fist, and the iron glove. Who was it coined that? Haydon: I got him home, didn’t I? Smiley: Yes. That was good of you. The clearest sign that Haydon has got under Smiley’s skin is demonstrated by the angry way Smiley opens the door after he’s finished his questioning. A small moment, like many of Smiley’s brief displays of anger, but it’s quite telling. Haydon never made it back to Moscow, he was murdered before the exchange could be made. The novel implies (but doesn’t overly state) that Jim Prideaux killed him, the television adaptation is a little clearer on this point. This leaves a final scene, which effectively acts as a coda, in which Smiley and Ann discuss her latest (completed) affair as well as Bill Haydon. She tells Smiley that she never loved Bill, and her final words “Poor George. Life’s such a puzzle to you, isn’t it?” is a bittersweet ending to an exceptional drama serial. LeCarre’s novel opens with Jim Prideaux taking up his new role as a schoolmaster. Periodically through the book we return to Pridaeux and witness his growing friendship with one of the boys, Bill Roache, nicknamed “Jumbo” by Pridaeux. Arthur Hopcraft’s adaptation chooses to keep all the school material until this episode, rather than scatter it throughout the story. This was probably the right thing to do, although it does mean we lose a great deal of the interaction between Prideaux and Roach. But a little does remain, such as the scene where Roach spies Prideaux digging up a package. Roach can’t resist taking a peep through the caravan window (where Prideaux lives) and is shocked to see him holding a gun. Prideaux: We’ve got a secret, haven’t we? I can trust you, I know that. We’re good at keeping secrets, loners like you and me. Roach: Is it because of that man? Would you shoot him? Are you working undercover, like Bulldog Drummond in the book? Some of the boys wanted to call you Bulldog, but we thought Rhino was better. Bigger than a bulldog. Prideaux: How I got it, they’re both secrets, I keep them to myself. Y’understand that, don’t you Jumbo? Prideaux: Knew you would, knew you would. Since getting shot, Jim’s turned into something of an eccentric, at least when the schoolboys are around. He lets them drive his vintage car (an Alvis, his pride and joy) and has clearly made a deep impression on many of them (especially Roach). But he still has wounds that haven’t healed (and not just physical ones) which will be examined later on, when Smiley visits him. But before Smiley speaks to Prideaux, he makes a call on Sam Collins (John Standing) who was duty officer the night Jim Prideaux was shot. When the crisis happened, Sam was unable to get much sense out of Control – so he recalls how relived he was when Bill Haydon turned up. It’s been repeated several times already just how close Bill Haydon and Jim Prideaux were, and this is clear when Bill takes charge. All right, Sam. Now, first thing you do, you call this number, it’s Toby Esterhase’s. Tell him you’re speaking for me, and he’s to pick up the two Czechos we’ve had our eyes on in London School of Economics, and lock them up. Now, right away, Sam. Jim’s worth a lot more than those two, but it’s a start. I’ll have a word with the chief hood of the Czech Embassy. If they hurt a hair on Jim Prideaux’s head, I’ll strip the entire Czech network in this country bare. You pass that on. I’ll make him a laughing-stock! 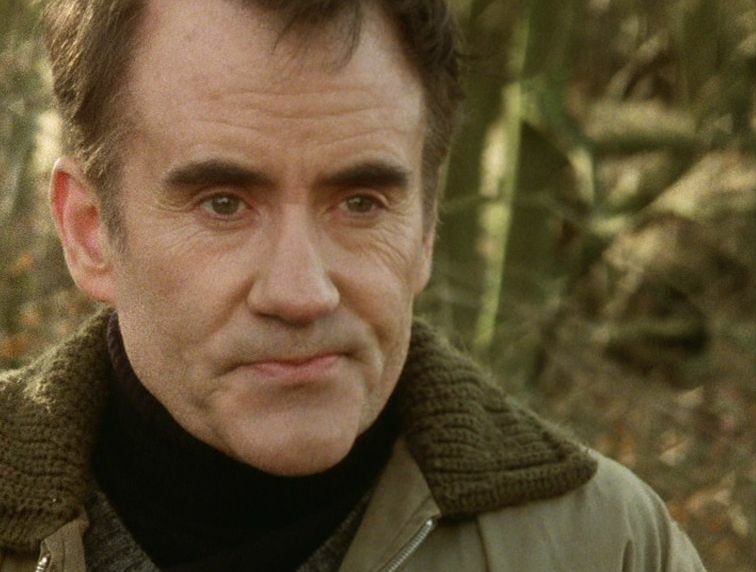 If Tinker Tailor Soldier Spy is a collection of great acting moments, then Ian Bannen’s in this episode must rate very highly. And although his part of the story seems to be over, events might prove otherwise …. 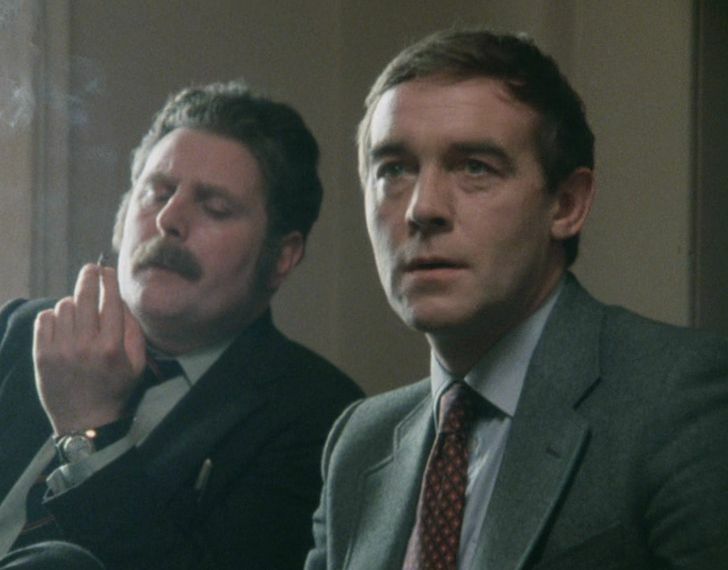 In many ways Michael Jayston is the glue that holds Tinker Tailor Soldier Spy together. With Smiley remaining in the shadows until the end, it’s Peter Guillam who has to act as Smiley’s leg-man (for example, venturing into the Circus) to obtain the information that he needs. Guillam isn’t a showy part, but Jayston is perfect casting. When Smiley’s People was made a few years later, Jayston presumably wasn’t available – so the role of Guillam was played by Michael Byrne. Byrne’s a decent actor, but Jayston’s loss was keenly felt. Guillam finds himself confronted by the Circus’ top-men, with Alleline very much on the warpath. He tells him he’s been seen with Ricki Tarr. Guillam denies this and it becomes obvious that Alleline doesn’t have any proof – it’s more of a fishing exercise. 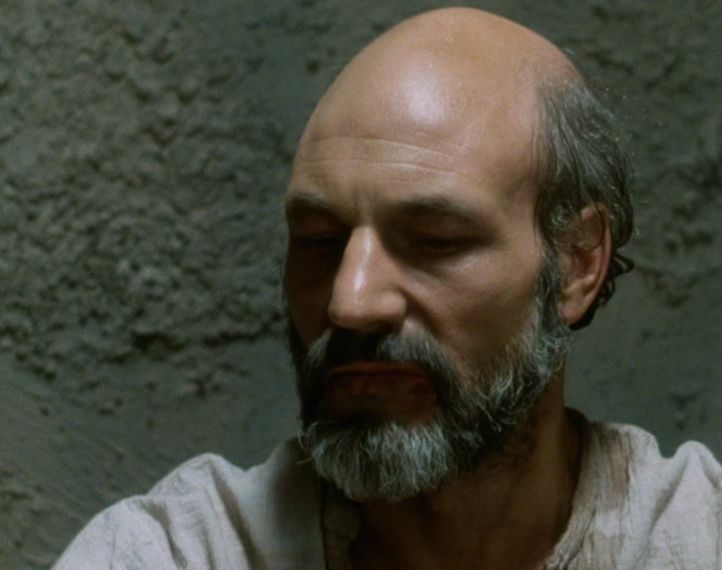 Source Merlin has divulged that Tarr’s wife and child are en-route to England, so logically Tarr must be here as well. And it’s clear that Alleline doesn’t believe Guillam’s denials. Alleline: What the hell are you shrugging at us like that for? I’m accusing you of playing hooky behind our back with a damn defector from your own damn section, of playing damn-fool parlour games when you don’t know the stakes! And all you do is shrug at me? There’s a law, Guillam, against consorting with enemy agents! You want me to throw the book at you? Guillam: I haven’t seen him! If anybody’s playing parlour games it’s not me, it’s you! So get off my back! Whilst waiting for Guillam to return, Smiley and Mendel discuss him. Mendel’s slightly concerned, since he’s heard some details about Guillam’s past operations – but Smiley remains confident in him. It’s a scene that helps to give Peter Guillam a little more depth. Mendel: He does sound jumpy. He might have overdone it a bit there. He was very loud. I’ve seen it all before, tough ones who crack at forty. They lock it away, pretend it isn’t happening, all of a sudden you find ’em sat in front of their desks, the tears pouring on the blotter. Smiley: I think Peter will manage. You heard something about his murderous assignment in French North Africa, I suppose? Smiley: Peter was over-matched, and lost. His agents were hanged. No one recovers entirely from that sort of thing. That is, I wouldn’t trust a man who did. Later, Smiley and Guillam discuss Karla (Patrick Stewart) the man who is undoubtedly running the mole. Smiley reveals that he met him once – in the mid 1950’s, long before Karla became the legendary figure he now is. In the flashback scene of their meeting it’s notable that Stewart doesn’t have to utter a single word – Guinness does all the talking. Look, I am not offering you money or hot women or fast cars, you have no use for such things. And I am not going to make any claims about the moral superiority of the West. I’m sure you can see through our values, just as I can see through yours in the East. You and I have spent our lives looking for the weaknesses in each others systems. I’m sure each of us experienced innumerable technical satisfactions in our wretched Cold War. But now your own side is going to shoot you, for nothing. For misdemeanors you have not committed, because of a power struggle within your own kind, because of someone’s suspicions or sheer incompetence. As there’s still three episodes to go, there’s a certain sense on running on the spot – but there’s still some important matters to be discussed. The news that Irina has been executed in Moscow causes Smiley some concern. 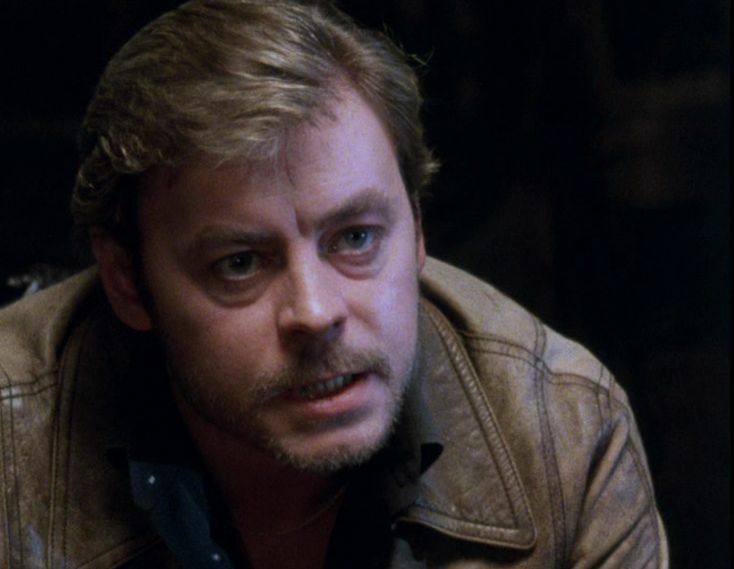 Smiley: Ricky Tarr mustn’t know. It’s vital that he gets no wind of this! God knows what he would or would not do if he found out, and we may need to make further use of him. Guillam: Do you really believe all that guff about Tarr being in love with her? The little homestead in the Highlands? The avenging lover, the honourable Ricky Tarr? Smiley: He may be compelled, Peter, everyone has a loyalty somewhere. He mustn’t know. It’s a moment that once again raises the question whether Ricky had any feelings for Irina or if he was purely interested in her for the information about the mole. And Jim Prideaux has been tracked down (he’s teaching at a minor prep school) and it’s clear he’s somebody that Smiley needs to talk to urgently. It’s emphasied that Prideaux and Bill Haydon were great friends. Since this has been mentioned several times before, it’s obviously a point of some importance. But it was a non-comic role, The Killing of Sister George, firstly on stage (for which she won a Tony award) and later on film (where she received a Golden Globe nomination), that really bought her to prominence. During the 1970’s she appeared in a number of films such Rosie Dixon – Night Nurse and Carry on Emmannuelle, which are pretty grim viewing, although they’re apparently comedies. But there were also decent roles in several BBC Plays of the Month, such as Mrs Malaprop in Sheridan’s The Rivals and Amanda in Bernard Shaw’s The Apple Cart. Her somewhat unpredictable career path would later lead her to the role of Connie Sachs in episode three of Tinker Tailor Soldier Spy. 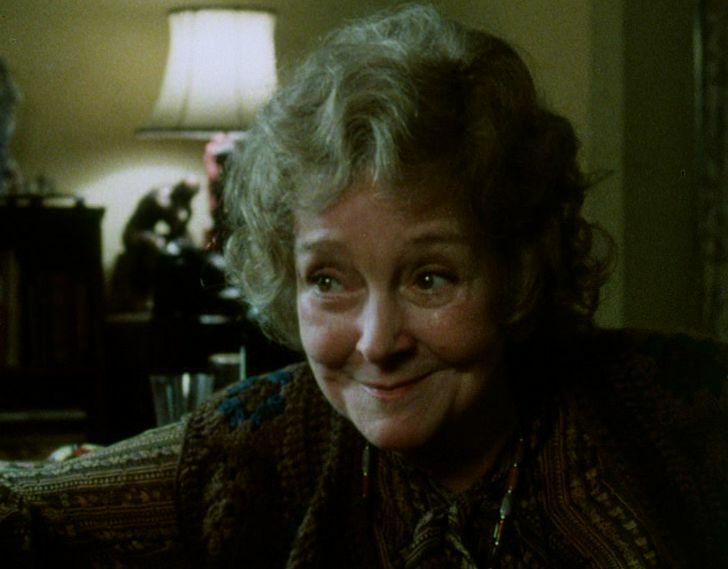 Critically, both this and her later appearance as Connie (in Smiley’s People) can be considered career highlights – she was BAFTA nominated as Best Actress for Tinker Tailor Soldier Spy and won the BAFTA Best Actress award for Smiley’s People. With official Circus records not available to him, Connie is an invaluable resource, since she has instant recall of every case that ever passed her desk. Smiley is interested in an agent called Polyakov and Connie recalls that when she tried to get Esterhase and Alleline to investigate him further, they declined. And shortly afterwards Connie was retired from the Circus. Another example of someone too close to the truth about the mole having to be removed? The Circus, as befits Britain in the late 1970’s is somewhat shabby and tired-looking. This is exemplified by the squeaky lift door. When Guillam says it’s about time that it was sorted, the receptionist gloomily tells him that he’s asked for it to be dealt with on more than one occasion. Guillam’s visit is fruitless – the log has been tampered with and a vital page removed, but along the way he bumps into Haydon, Bland, Esterhase and Alleline who all react to him with varying levels of suspicion. Haydon seems the most amused. “What the hell are you doing here, you pariah?”. But like all spies, he’s not always easy to read. These scenes give us our first proper look at the four top men at the Circus – one of whom is “Gerald” the Soviet mole. They didn’t appear in episode two and their only appearance in the first episode was in the pre-credits sequence, when the four of them silently entered a meeting-room. The scene in the first episode is worth looking at in a little more detail, as even though none of them utters a word, it clearly defines their characters. First to enter is Toby Esterhase, the fact he’s the first to arrive and that he gets up later to close the door behind Haydon clearly demonstrates his fussy, precise nature. Next is Roy Bland, who arrives with a casual air and a cigarette dangling from his mouth. Bill Haydon is the third one in – balancing his cup of tea with the saucer on top, he betrays a sardonic, amused attitude. Finally, Percy Alleline arrives, with a pompous, self important persona. The remainder of the episode is told in flashback, some six months before Control’s death. Alleline has just proudly unveiled his Witchcraft material, much to Control’s disgust. Alleline: Merlin is the fruit of a long cultivation by certain people in the Circus. People who are bound to me as I am to them. People who are not at all entertained by the failure rate about this place. There’s been too much blown, too much lost, too much wasted. Too many scandals. I’ve said so many times, but I might as well have talked to the wind for all the heed he paid me. Control: “He” means me, George. Alleline: The ordinary principles of tradecraft and security have gone to the wall in this service. It’s all “divide and rule”, stimulated from the top. Alleline: We’re losing our livelihood. Our self-respect. We’ve had enough. We’ve had a bellyfull, in fact. Smiley draws a blank with all three. First he speaks to Toby Esterhase. Esterhase: My problem is promotion. I mean the absence of it. I have so many years’ seniority that I feel actually quite embarrassed when these young fellows ask me to take orders from them. Smiley: Who, Toby? Which young fellows? Roy Bland? Percy? Would you call Percy young? Who? Esterhase: When you’re overdue for promotion and working your fingers to the bone, anyone looks young who’s above you on the ladder. Esterhase: Actually, George, I am not too sure he is able to. Roy Bland, despite being a protegee of Smiley’s, is equally disinterested. If there’s no deal, you’ll have to tell Control to get stuffed! I’ve paid, you see, you know that! I don’t know what the hell I’ve bought with it, but I’ve paid a packet. Poznan, Budapest, Prague, back to Poznan – have you ever been to Poznan? – Sofia, Kiev, two bloody nervous breakdowns and still between the shafts! That’s big money at any age. Even yours. 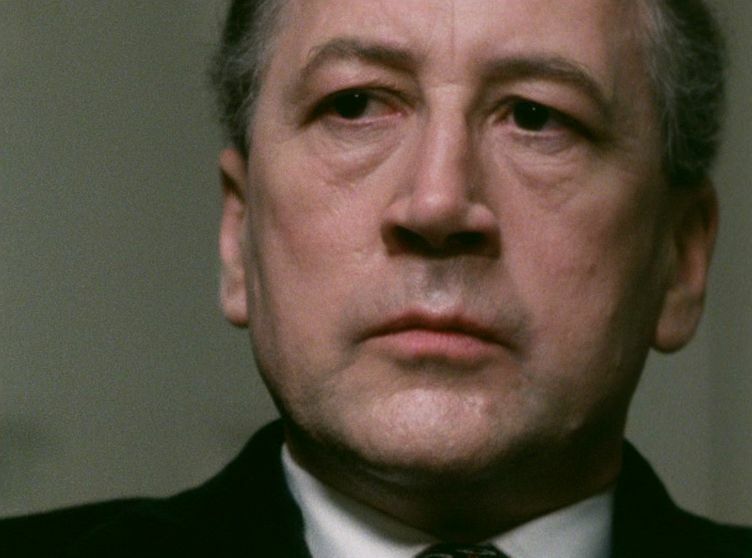 The relationship between George Smiley and Bill Haydon is tense, since Haydon had previously had an affair with Ann, Smiley’s wife. He does, however, argue quite convincingly that Control’s problem is with Alleline – not the Witchcraft material. With the personalities of the four top men now firmly established, Smiley begins his investigation in earnest. Tinker Tailor Soldier Spy was certainly a series that took its time. With seven episodes to play with, it could afford to take the long road – and this was very evident in episode two. Ricki Tarr’s story runs for the first thirty minutes and it’s fair to say that the amount of plot in this section could have easily been condensed down to, say, ten minutes. But plot obviously wasn’t the overriding factor here – rather, it’s character and atmosphere. So while Tarr’s romancing of the Russian spy Irina (Susan Kodicek) is told at a leisurely pace, it doesn’t feel drawn out and the location filming in Lisbon helps to bring a dash of colour to a series that otherwise exists in the (intentionally) drab world of British intelligence. Tarr is about to report back that Boris is a no-go, when he decides to take a look around his apartment and see what happens. It’s dangerous and possibly somewhat reckless, but that sums up Tarr’s character – he’s someone who is supremely confident in his own abilities to extricate himself from any situation. When he breaks into the flat, Boris isn’t there – but his wife Irina is. Tarr puts on an Australian accent and spins her a line about how Boris has stolen his girlfriend. He manages to use all of his considerable charm to arrange another meeting the following day, but he quickly learns that Irina is no fool. There’s an English expression. ‘It takes one to spot one’. You wouldn’t have fooled me for long. It’s the way we look for things, isn’t it? We don’t stare. We don’t seem to be looking. We are not like tourists … or prostitutes … or pickpockets. We just know how to see. The relationship between Ricki and Irina is the heart of the episode – and it’s a fascinating one. As they’re both spies, how much trust can we put in what they say? Ricki seems to be the colder, more professional one. He picks up Irina for no other reason than to understand what makes Boris tick. As their brief relationship blossoms, does he ever feel any genuine love for her? Or is the fact she has information about a mole in British Intelligence the reason for his growing interest in her? Irina professes love for Ricki. But again, can we believe her? Or is she simply telling him this so that he’ll take her back to London as a defector? The fact she leaves him a series of notes in a dead-letter drop does indicate that her feelings were geniune. By the time he visits the drop, she’s gone – forcibly taken back to Moscow where, presumably, a brutal interrogation awaits. Was she betrayed and if so, was it the mole in London? Her parting gift to him is the sheaf of documents which detail what she knows. “I would prefer to give you my life, but I think that this wretched secret will be all I have to make you happy. Use it well”. Her notes confirm that the mole in London is known by the codename of Gerald and that he’s a high-ranking member of British Intelligence. She doesn’t name names though, so Lacon needs somebody to investigate the Circus clandestinely and Smiley is the obvious man for the job. Especially since six months previously he tried to convince Lacon that there was a mole – only for Lacon to dismiss him out of hand. Since the bulk of the episode is taken up with Tarr’s flashback, there’s not a great deal of screen time for Alec Guinness, but he’s still so good when he does appear – especially when he and Anthony Bate are walking through Lacon’s garden, discussing how the enquiry will work. As ever, it’s a masterclass in underplaying. Smiley and Lacon also discuss how well the Circus has been doing lately, especially with Alleline’s source of material, codenamed “Witchcraft”. The mysterious source, Merlin, has provided the Circus with invaluable intelligence – but the uncomfortable, unspoken question is how much credence can be placed on this material if Moscow have an agent at the heart of the Circus? Is Witchcraft information or disinformation? That can wait for another time, for now Smiley is holed up in an anonymous hotel, where he can work undisturbed. He plans a trip to Oxford to visit an invaluable source whilst he asks Peter Guillam to break into the Circus to steal some key files …..